We are fast approaching the pear picking season (August & September in southern climes, September & October in northern), so why not go to your local pear orchard with something more than sliced pears in mind? 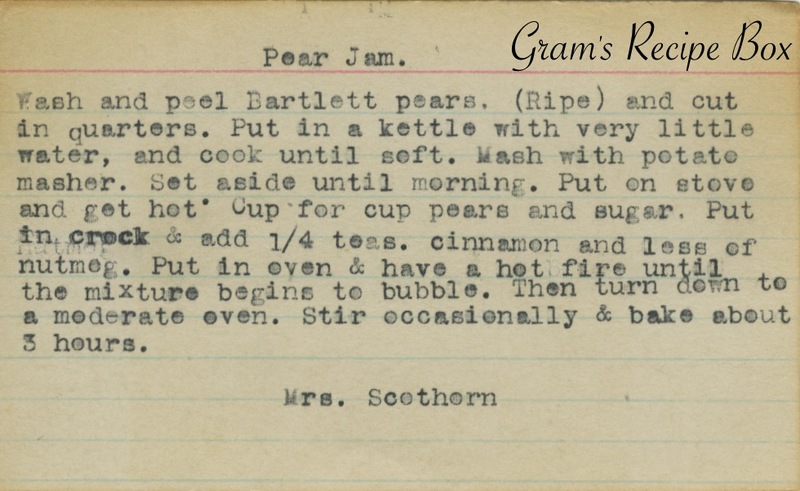 Mrs. Scothorn shared this recipe for pear jam back when typewriters used inked ribbon and likely weighed around 50 pounds. I don’t know about cooking this in the oven. I’d want to be able to check it easily; perhaps it could be made in a crock pot to simulate the oven? Pear jam doesn’t have to be overly sweet, and would be nice on toast, muffins or biscuits. Wash and peel Bartlett pears. (Ripe) and cut in quarters. Put in a kettle with very little water, and cook until soft. Mash with potato masher. Set aside until morning. Put on stove and get hot. Cup for cup pears and sugar. Put in crock & add 1/4 teas. cinnamon and less of nutmeg. Put in oven & have a hot fire until the mixture begins to bubble. Then turn down to a moderate oven. Stir occasionally & bake about 3 hours.